Edmund Blake, the stage name of Frederick Alkin, was the first actor to portray Dracula in Hamilton Deane’s official adaptation of Dracula. 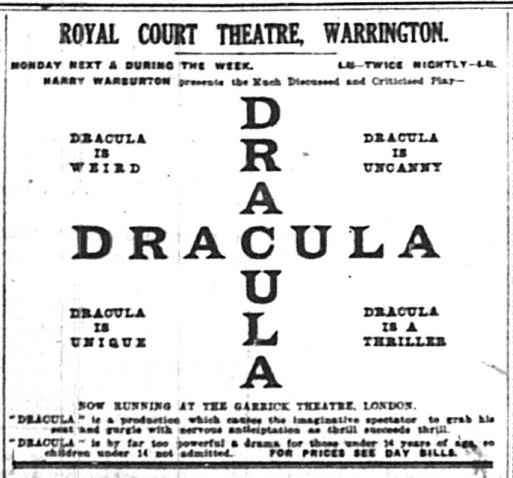 The opening night at the Grand Theatre in Derby was attended by Bram Stoker’s widow, Florence. 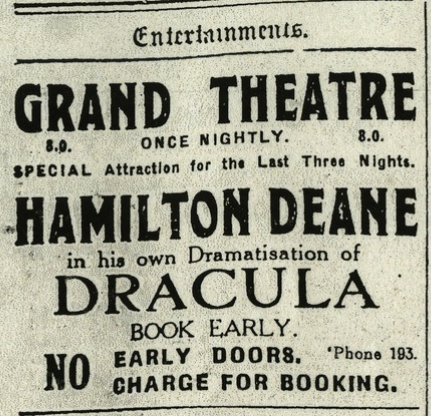 The premiere of Hamilton Deane’s adaptation of Dracula has long been incorrectly given as August 5, but it actually took place over two months earlier. LUTON—Grand (L. and M., E Graham Falcon; G. M., Walter Bellian).—Harry Warburton’s company opened a week of repertory on Monday with “Dracula,” adapted by Hamilton Deane from the novel of Bram Stoker. Mr. Deane deserves praise for the manner in which he has adapted a somewhat awkward subject. Prominent is the cast is Hamilton Deane, whose study of Abraham Von Helsing is at once convincing and clever. In the name-part Edmund Blake maintains an air of mystery, and the sinister nature of the Count is well brought out. Stuart Lomath acts with strength as Doctor Seward; while Barrie Livesey is a sympathetic Jonathan Harker. Dora Patrick as Mina Harker has a difficult part, but overcomes all difficulties. G. Malcolm Russell deserves mention for his clever study of R. M. Renfield, and Winifred Wayne is a businesslike Quincey P. Morris. Kenneth Thomas does well as Lord Godalming. Nan Braunton is an efficient parlourmaid. Jack Howarth as the Warder and Ruth Nixon as the housemaid make the most of small parts. On Monday evening Mrs. Bram Stoker, widow of the late Bram Stoker, witnessed for the first time the dramatised version of her late husband’s work. Edmund Blake returned to the role of Dracula as a member of Harry Warburton’s No. 1 company. Warburton was the general manager of the Royal Court Theatre in Warrington and the backer of Hamilton Deane’s production. It would be idle to speculate upon the number of book-lovers who have read the famous novel of Bram Stoker, “Dracula,” into the early hours of the morning, and then, with many a nervous glance, behind them, retired to rest to dream strange dreams. The stage version of the novel, written by Mr. Hamilton Deane, who is well-known in Warrington, loses nothing of the eeriness conjured up by the written word. It will be remembered that when Mr. Hamilton Deane himself toured and acted Van Helsing in “Dracula,” he told his audiences plainly that it was a “shocker,” and some time ago in a special interview, he informed “The Examiner” that even the actors and actresses were “nervy and jumpy” when waiting in the wings for their cue. 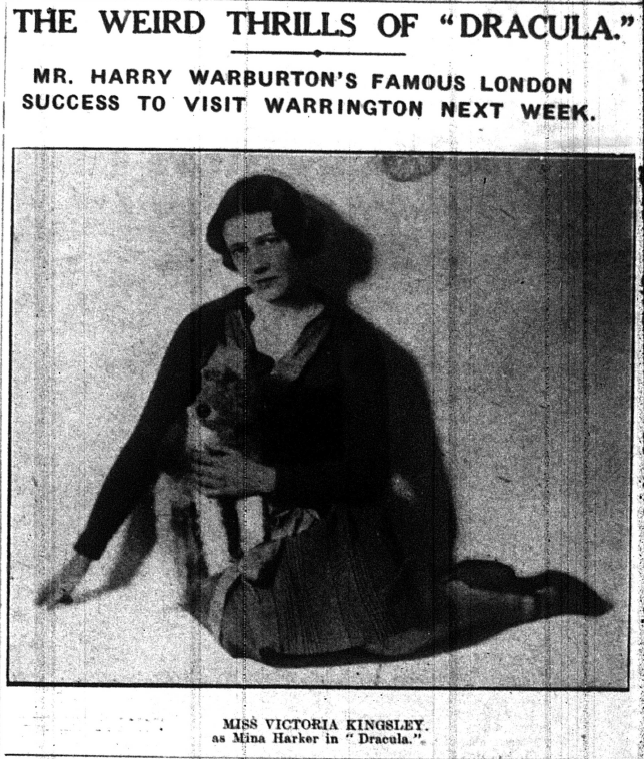 Since then Mr. Harry Warburton, the manager of the Royal Court Theatre, has interested himself in the play, with the result that it has achieved a great success in London, and has played at the Little Theatre, the Duke of York’s Theatre, the Prince of Wales’s Theatre and the Garrick, which Mr. Warburton has leased for six months. Incidentally, it is being produced in New York, and has had somewhere about three hundred performances. It is said, such is the influence of “Dracula” on the audience, that a nurse has to be kept on duty to deal with those who faint, and she attended over a hundred patients, mostly men! 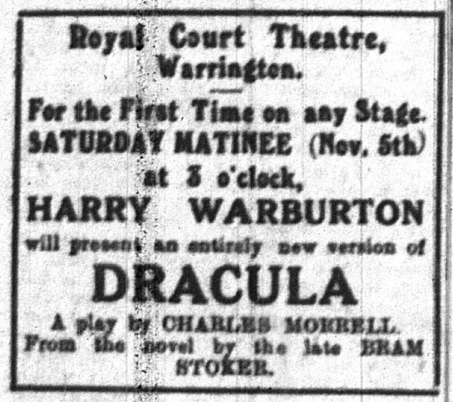 Such are the Warrington associations with the play, that more than usual interest will be taken in the presentation of “Dracula” by Mr. Harry Warburton’s No. 1 Company at the Royal Court Theatre next week. “Dracula” is said to be even more appalling in its fascination than “Wuthering Heights,” “The Beetle” and “The Fall of the House of Usher,” and is undoubtedly one of the most discussed and criticised plays of the day. It is remarkably well staged, and has a clever cast. On Saturday afternoon, Mr. Warburton will present an entirely new version of “Dracula” by Charles Morrell. For the 3 o’clock matinee performance on Saturday November 5th, the cast presented the only known performance of Charles Morrell’s new adaptation of Dracula, which was commissioned by Bram Stoker’s widow Florence in an attempt to secure more royalty payments for herself. Edmund Blake played the title role. There was an occasion perhaps unique in theatrical history at the Royal Court Theatre on Saturday, when Mr. Harry Warburton’s “Dracula” company played two versions of a play on the same day. A new version of the vampire play was played for the first time at a special matinee performance and the original version was given at the two performances in the evening. Under Mr. Warburton’s management the play is having an extremely successful run, having been presented nearly 300 times in London, where it is now at the Garrick Theatre, and in the provinces there have been more than 1,000 performances. At the Garrick Theatre it is still doing well, and it is not proposed to take the new version to London for some time. The new version, which was well received by a large audience, retains the many thrills of the story, but is less gruesome than the original version. The dispatch of Count Dracula is effected in a different fashion, though none the less exciting, and the lunatic is not murdered, but regains sanity, while the play is concluded in happier circumstances. Mr. Charles Morrell is the author. MIDDLESBROUGH – Grand Opera House (M.D., T. Thompson; R.M., W. B. Thompson; M.D. J. Chutzey) – “Dracula” is attracting large audiences here. Edmund Blake as the Count scores a well-deserved success, and E. Bellenden Clarke as the Dutch scientist acts with conviction. Victoria Kingsly as Dracula’s victim acts with pathos, and fine character studies are rendered by William Clayton and Wilfred Fletcher. That gruesome, weird and horribly fascinating vampire and un-dead play “Dracula” reached it fifth Central London theatre at the popular King’s Cross house on Saturday, when it played to 2,800 persons; and it had its 400th performance in town there on Monday, when crowded houses and almost hysterical interest on the part of impressionasble girls seemed to be the order of things. So long were the queues and so heavy was the advance booking that the authorities at the Regent, where Mr. Mark Sabine and Mr. Harry Warburton are presenting the London Repertory company in “Dracula” intend to keep Hamilton Deane’s highly successful adaptation of Bram Stoker’s novel in the bill for at least a second week, very likely longer. As produced by Mr. Sabine, with Mr. Ellis J. Preston and Mr. Lawrence Shiel concerned in the stage management, “Dracula” is receiving at the Regent a performance hardly if at all inferior to those it had at such West End theatres as the Little, the Duke of York’s and the Garrick, and the exigencies of the two-house-a-night system appear not to have affected its powers of moving and thrilling popular audiences. That favourite with the regular patrons of the Regent, Mr. Gerald Neville, assumes and maintains successfully a suitably guttural foreign manner of utterance on the part of the un-dead Count’s implacable and finally triumphant adversary, the Dutch man of science, Abraham van Helsing, whose reasoned arguments and deliberately executed plan of action Mr. Neville makes duly effective. Much praise should go also to Mr. Edmund Blake, who simulates skilfully the leaden-white visage, hideous lips, and red eyes of the Transylvanian noble, attired in evening dress with red-lined cloak. Mr. Blake suggests ably this vampire or were-wolf’s various manifestations and his arising out of a mist to glide or swoop down upon his prey. As Dracula’s latest victim Mina Harker, Miss Joan Carrington indicates well enough her process of gradual change into another un-dead creature, like Lord Godalming’s unhappy fiancée Lucy. The young peer, the anxious husband Jonathan Harker, and the rather too-matter-of-fact and obtuse Dr. Seward, are sustained more or less capably by Mssrs. Richard Turner, William Lorrimer, and William Dewhurst. Miss Peggy Mortimer plays very brightly as the fearless Texan girl Quincy P. Morris; Mr. Claude Ricks makes one of the hits of the performance by his vivid yet unexaggerated assumption of the fly-and-spider gobbling lunatic R. M. Renfield; and Miss Holly Tapper has just the right far-away look as the hypnotised parlourmaid whom the Count forces to do his bidding. The comic scene of love making between the housemaid and the asylum warder in search of Renfield is played on the accepted lines by Miss Dorothy Dewhurst and Mr. Horace Custins. The weird and horrific effect required for the production of “Dracula” are managed excellentgy right up to the final disappearance of the Count into dust after his body has been stabbed to the heart in his last earth-box.